We hope you can make it--these trips are a blast--great fishing, food and camaraderie, and some of the most spectacular scenery anywhere. Remember, booking your guided trip with us doesn't cost any more than booking directly with the lodges. Plus, you'll receive the added advantage of having a trip host on your adventure, who is there to make sure that your trip is enjoyable and hassle-free. Your trip host will be available to help with any tackle questions or problems that arise. We will have extra gear in the event of equipment failure or breakage. Extra leaders, tippet and flies will be available too. If you need help booking your flight and making travel arrangements, we can help. Our hosted trips are fully guided by local native, knowledgeable guides & there is no additional cost added to the trip for our assistance. Our goal is for all guests to have the adventure of a lifetime! 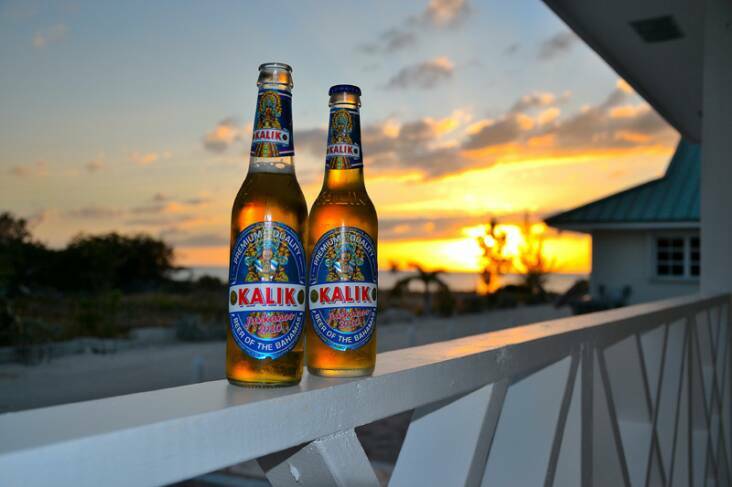 On Crooked Island, we have found what we believe to be one of the best deals in the Bahamas. The bonefishing/flats fishing is excellent, and the shallow water reef program adds another dimension to the great flats fishing already offered. The guides are great, and they work hard, often staying on the water for 10 hours. Their boats are top-notch, and better than we have seen anywhere we have visited in the Bahamas. The lodging is also modern, clean and very comfortable, and you can watch the sun setting over the ocean every evening, not to mention you can catch jacks, snapper, grouper and barracuda right from shore. And there are very few bugs here, for reasons unknown to me. The food is also superb, and as fresh as you can get it. Lobster, wahoo, mutton snapper, grouper & conch are just some of the tasty dinners we'll enjoy. 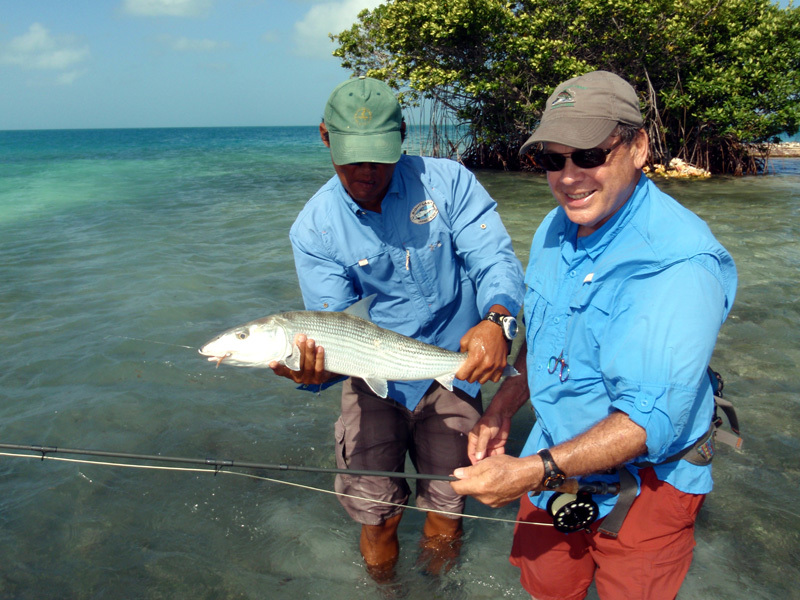 The cost is $2995.00 per person for seven nights, six full days of guided fishing. (based on double occupancy) *Cost includes guides, lodging, all meals & non-alcoholic drinks on Crooked Island, and airport transfers from Crooked island airport to the Lodge. *You pay for airfare to Crooked Island, one night’s lodging, taxi & dinner in Nassau, tips, and alcohol, if desired. We are hosting a trip to Christmas Island (republic of Kiribati) in the central Pacific Ocean. Renowned for great bone fishing, with endless hard packed sand and coral flats, Christmas island also offers giant and Bluefin trevally, indo pacific triggerfish, as well as bluewater fishing very close to shore. This trip should be on any saltwater flats angler's bucket list. 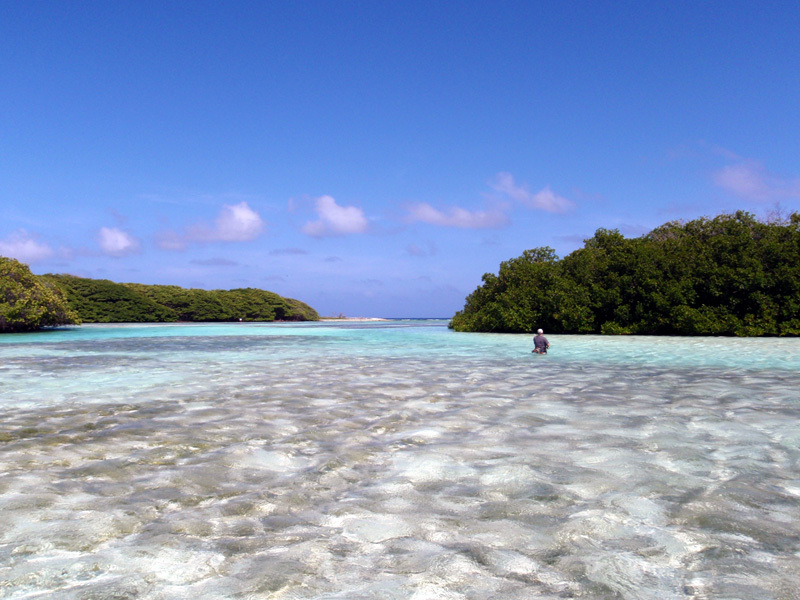 Guests stay on the water at Ikari House, a great location with easy and fast access to the inner lagoon. The rate for the 7N/6D package is $2792 per person, dbl occup. Included in the package are accommodations, guided fishing, all meals, non-bottled beverages. Excluded are your international flights, guide and staff gratuities, bar tab and items of a personal nature. Come fish the Catt & other area tribuatries with CCO for spring steelhead, and some early running smallmouth bass as a bonus! Single hand & two handed enthusiasts welcome! We have made some changes to the format of our camp. The guide ratio will be 1 guide for every 2 anglers, unlike the old ratio of 1 guide for 3 anglers. Also, the camps will include dinners on the two days of guided fishing, as well as all breakfasts and lunches on the guided days. To reserve a spot requires a deposit of $200 per person. You can make checks payable to Cattaraugus Creek Outfitters. The balance is due at the end of your trip. If you are interested in going to Alaska on this once-in-a-lifetime adventure, please let us know. The trip is hosted by me, and the lodge is run by friends of ours from Upstate NY. This week is the start of the Silver salmon run, & also has chum & sockeye salmon, plus great mousing for rainbows & dolly varden, as well as grayling. The silver salmon (coho) on this river are chrome bright, take dry flies, love to jump and are great fighters. This river is a fish factory! It's fly in only and this lodge is one of only 3 lodges on the river. The Kanektok (aka the Chosen River) is a fly fisherman’s dream. The river is the perfect size and provides outstanding spawning grounds for all five species of Alaskan Pacific salmon. Located in southwestern Alaska near the village of Quinhagak, our camp is perfectly situated within the Togiak National Wildlife Refuge. Encompassing over 4 million acres, it is home to some of the most prolific salmon runs in the world and hosts a wide variety of fish, bird and mammal species. From rolling tundra to the highest mountain peaks, and from the rugged coastlines to crystal clear rivers, the Togiak National Wildlife Refuge is a haven for all things wild. A magical place by any account, its ability to support wildlife and sustain natural populations of WILD fish truly set it apart. 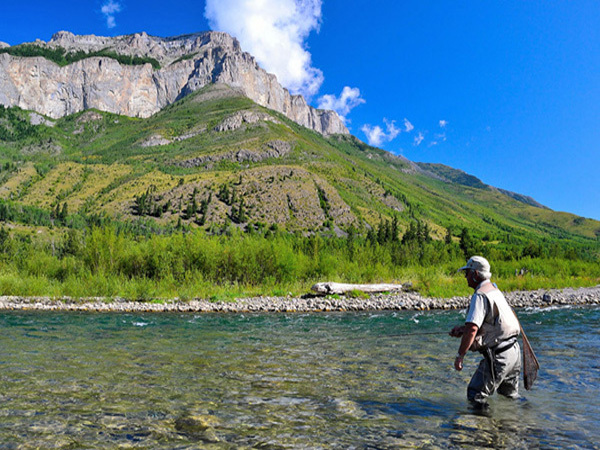 In the clear waters of the Kanektok, anglers will find king, coho, sockeye, chum and pink salmon, as well as trophy-sized native rainbow trout, arctic char, grayling, and dolly varden. The Kanektok and its tributaries and braids give anglers access to some of the best sport fishing in the world. We are extremely lucky to be here on this river and are excited to share this very special area with you. The Kanektok river fishing season is dictated by the king and silver salmon fishery and has excellent trout fishing. The kings run June 15th – July 25th while the silver salmon run July 23rd until Sept 10th. The king salmon escapement goal is 3,500 - 8,000 per season. The silver salmon escapement goal is 50,000 per season. During the month of July the Kanektok receives a run of 50,000 – 200,000 chum salmon and on even years receives a run of over 100,000 pink salmon. The river also has a run of 50,000 - 200,000 sockeye salmon in mid July. The rivers’ rainbow trout are most prevalent in the braided section of the river. There are trophy rainbows available with some close to 30 inches. The dolly vardens are sea run with over 20,000 - 35,000 passing the fish weir last year. The river also has a good grayling population. Your trip includes all accommodations, guides, meals, rods, reels, flies, terminal tackle, and a DVD of pictures or video from your trip.